Growing up in Hamburg, Steven Simon’s mutual fascination with the city of Tokyo and taking pictures are intertwined in his memory. “My father used to work for Olympus and always had cameras lying around at home,” he says. For this Tokyo series, Steven used only film cameras, a medium he now favors over digital. “I got bored by the thousands and thousands of useless images I’d shot,” he explains, referring to his first foray into digital photography as a teenager. 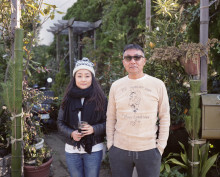 “They lost their magic since I could just hit the button and take the same image three or four times.” After a lengthy hiatus, Steven decided to take up photography again, this time using his dad’s old Japanese analog cameras. “At the beginning of my twenties, I found that I was missing something. Taking pictures had always been something ruminant and soothing—and it’s a lot of fun—I just needed a way to get around my old habits of just taking pictures of anything that meant nothing to me,” he explains. Thanks, Steven, for sharing your trip to Japan with us. Take your own adventure through his oeuvre or keep up with other FvF contributors on our travel blog.